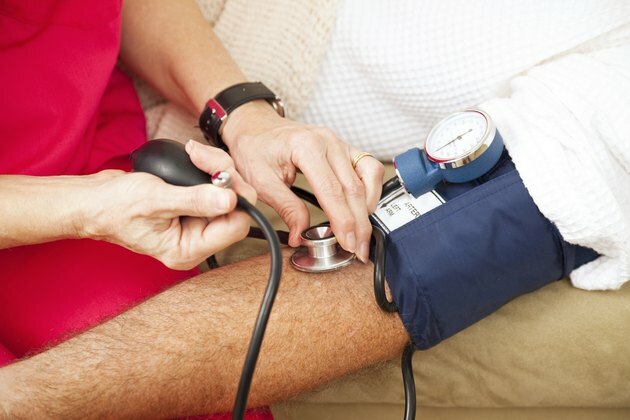 High blood pressure, also known has hypertension, contributed to the deaths of 410,000 Americans in 2014, according to the Centers for Disease Control and Prevention (CDC). Also, 1 in 3 Americans suffer from hypertension, and because symptoms are absent unless blood pressure is extremely high, many people do not even know that they have it. To monitor and manage this condition, your blood pressure readings have to be checked on a regular basis. While it's important to understand your blood pressure targets, it's also critical to understand the dangerous readings which require emergency medical care. Blood pressure measurements include 2 numbers. The first number is the systolic blood pressure, or measurement of the pressure in your blood vessels when your heart beats, and the second number is the pressure in your vessels when the heart rests between beats. According to the CDC, normal blood pressure is less than 120/80, and high blood pressure is considered above 140/90. If you have hypertension, your blood pressure should be checked on a regular basis -- at your doctor's office and preferably also by you at home. Your doctor will outline target blood pressure readings based on your health and age. If your blood pressure rises to severely high levels, this is considered a hypertensive crisis. According to the American Heart Association, if your blood pressure reading is 180/110 or greater, you should wait 5 minutes and recheck. If your next reading is just as high, seek emergency medical attention. When your blood pressure is severely high, early evaluation of your organ function is critical to assess the treatment you will need. Your critical blood pressure reading may also be accompanied by symptoms including severe headache, shortness of breath, nosebleeds or severe anxiety. The physician that treats your hypertensive crisis may add or adjust your medications, and keep you in the clinic, emergency room or hospital until your blood pressure has returned to a satisfactory level. If you are prescribed blood pressure medications, take your pills regularly and discuss any side effects with your doctor. See your doctor regularly and if able, check your blood pressure regularly at home to ensure you are staying within the targets recommended by your doctor. Uncontrolled blood pressure puts you at risk for stroke, memory loss, heart attack, eye or kidney damage, pregnancy complications and death. Even if one of your blood pressure numbers is dangerously high, you may still require emergency medical care. If your top number is 180 or higher or your bottom reading is 110 or higher, seek emergency care if you are having other symptoms, particularly if these include chest pain, shortness of breath, back pain, numbness or weakness, change in vision or difficulty speaking, call 9-1-1.